While the Declaration of Independence is revered for its eloquence, and inspirational philosophies, in the most straightforward sense it is a legal document written by a lawyer and approved by lawyers. Of the Declaration’s signers 25 of 56 were lawyers. Of the non-lawyers, the rest were in business and active in public affairs. The statistics are often mentioned, but the import of the statistics is almost never discussed. When you keep this commonality in mind, the form of the document makes sense. The principle author, Thomas Jefferson, was admitted to practice law at age of 24 and drafted the Declaration at still a young 33 years old. Here’s something about lawyers: Good lawyers imitate and improvise. We have a form for everything: real estate contracts, deeds, wills, answers to discovery, etc. All these forms are collected by topic and placed in a binder and we call them form books. These days of course, it’s even simpler with most of the forms on a CD or in the cloud. While language has changed, lawyers in the 18th Century had form books, and strangely enough, many of the standard legal forms have changed very little in over 200 years, since lawyers continue to imitate and improvise. A close look at the Declaration of Independence, reveals what Jefferson did: That is to imitate, improvise and pull out his form books. Think about this. The Declaration of Independence so resembles a legal complaint, the title very well could have been, The United States vs. King George. While five men were on the committee to draft the Declaration, Jefferson largely did it alone, and if he did not have a “form book” with him, he certainly had the form in his mind. • A statement describing the conduct of the plaintiff. • A conclusion that applies the law to the parties conduct, and the proper remedy for the conduct. 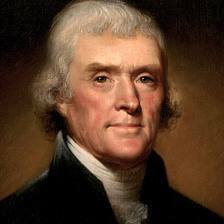 What Jefferson calls the “self-evident” truths is his statement of the law of natural rights (including the right to revolution), government purpose and the consent of the governed. The list of grievances against King George is the conduct of the defendant. “The most humble petitions” to the King from the colonists paint the plaintiffs in a good light. Signature of the Plaintiffs: Pledging their lives, their fortunes and their sacred honor. (A very big deal at a time when the penalty for treason was beheading and burning). This analysis is not to anyway diminish Jefferson’s work. In 2018, there are 195 countries in the world. 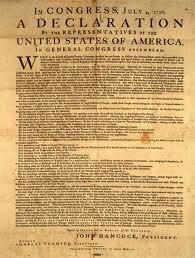 Over 100 of those countries announced their existence with documents modeled on the Declaration of Independence. The eloquence and eternal values expressed in the Declaration have changed the world, but the format preexisted the Declaration and is used daily in courtrooms around the world in the 21st Century. With luck you have not had a chance to look closely at a document that starts a lawsuit, but if you ever do, and you hold the legal complaint side by side with the Declaration of Independence. You will see this is the form Jefferson followed.